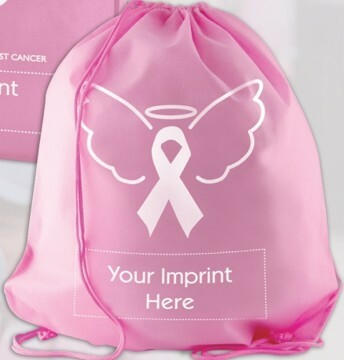 Large Breast Cancer Awareness Drawstring Backpack with stock imprint (see photo) and customized with your imprint. Lowest prices in USA and Canada. American clients pay no taxes. Free artwork design and free proofs! Our Breast Cancer Awareness Drawstring Backpacks are great to support all breast cancer awareness events. Unit prices below include your custom imprint in 1 color, on one side. Packaging: Bulk; 100 units per carton. 15 lbs per carton.